Josh loves pizza and is excited to share his all-time favorite pizza recipe with you today. When he first started making this BBQ Chicken Deluxe Pan Pizza I thought he was weird. 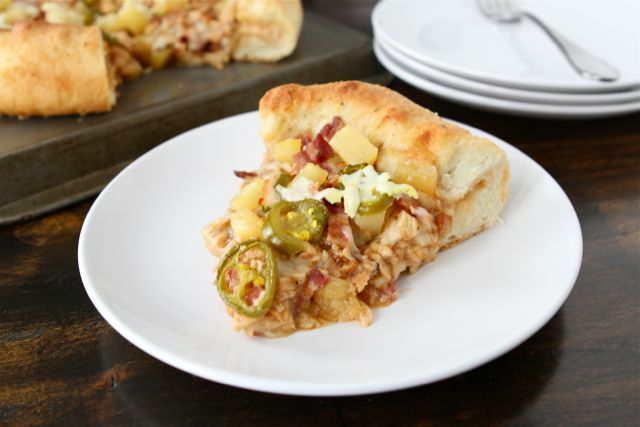 The pizza has BBQ sauce and is topped with BBQ chicken, bacon, pineapple, and jalapeño slices. Sounded kind of odd to me, but it is always a hit. I guess Josh knows his pizza:) We host pizza parties at our house with the neighborhood kids and it is always the first pizza to go. Kids and adults love Josh’s special BBQ Chicken pizza. Josh makes the pizza in a sauté pan or a cast iron skillet to give the pizza a thick crust. The dough takes about two hours to rise, so make sure you plan ahead. I promise, it is worth the wait. It is the best pan pizza crust! He rolls out the dough and places it in the pan. He fits the dough to the pan and then cuts off the excess dough. Josh usually makes me a veggie pizza with the leftover dough (yea, he loves me), but you can freeze the dough for later if you wish. The dough freezes well. This BBQ Chicken pizza is perfect for the upcoming Super Bowl. It has game day food written all over it. Josh’s BBQ Chicken Deluxe Pan Pizza is popular at all of our pizza parties and is sure to be a hit at your Super Bowl Party. Grab a slice and enjoy the game! Josh's all-time favorite pizza! 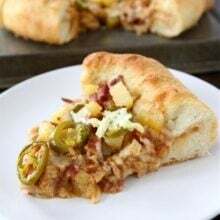 This BBQ Chicken Pizza is made in a pan to create a thick crust and is loaded with BBQ chicken, bacon, pineapple, jalapeño slices, and mozzarella cheese. 1. In a small saucepan, scald the milk over medium heat. Add butter, sugar and salt. Allow milk mixture to cool to warm. Add yeast and mix thoroughly. Let sit for 5 minutes. 2. In the bowl of a stand mixer, add milk/yeast mixture. Slowly add flour, one cup at a time, until the dough pulls away from the side of the bowl and forms a ball. Add water, a little at a time, until the dough combines. If the dough is still wet, add a little more flour. Knead dough for 5-10 minutes using the dough hook. Place dough in a large greased bowl. Cover and allow dough to rise for 2 hours or until dough has doubled in size. 3. While the dough is rising, brush the chicken breast with 2 tablespoons of BBQ sauce and grill. Chop cooked BBQ chicken into small pieces and set aside. 4. Preheat the oven to 400 degrees F. When the dough is ready, punch down the dough, knead briefly on a floured surface. Roll out the pizza dough, using a rolling pin. You want the dough to be about a 1/2 inch thick. Place dough in a buttered 10-inch sauté' pan or cast iron skillet. Push dough in the bottom and up the sides of the pan. Pinch off excess dough. You can save this dough to make another pizza or breadsticks. We usually stick it in the freezer for later. 5. Evenly spread 1/2 cup BBQ sauce on the bottom of the pizza dough. Top sauce with 2 cups of the shredded mozzarella cheese. Roll the pizza dough that is on the side of the pan down, about one inch, and pinch to form a thick crust. 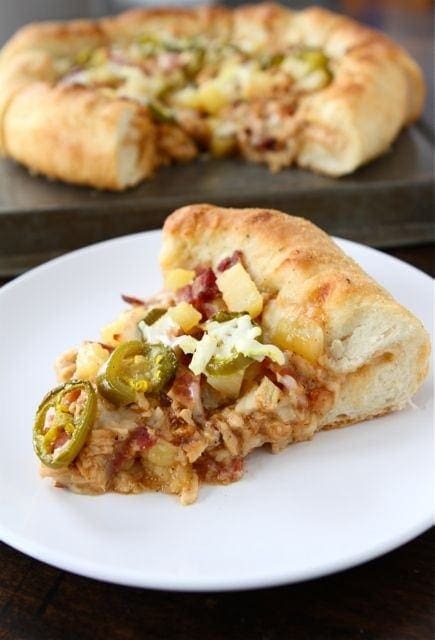 Add the BBQ chicken, bacon, pineapple, and jalapeño slices. Sprinkle pizza toppings with the additional 1/4 cup of cheese. 6. Place pizza in the oven and bake for 25-30 minutes, or until crust is golden brown. Remove pizza from oven and let sit for 10 minutes. Slice pizza with a bread knife and serve warm. Josh’s pizza looks amazing – look at that awesome crust! My boyfriend loves BBQ chicken pizzas too (they always seem weird to me as well!) so I’ll have to make this for him! Great job on the pizza…that cheese looks soo oozy and perfect! Im posting a pizza recipe today too! Perfect friday food!! I love bbq sauce-such a fun base! Oh man, hubby would go crazy for that! One of my fav pizzas! That pizza and crust looks amazing. We have a pizza dough that we have used for years, but I am definitely tempted to try yours for pizza night tonight instead. Happy Friday! I love BBQ chicken pizza! Thanks for the recipe! I’m making a roast chicken Saturday, maybe we’ll make the leftovers into pizza Sunday! You guys are obviously the best neighbors ever. If I lived next door, I would be all up in this pizza!!! That looks amazing. I love the jalapeno peppers. I want an invite to the next pizza party! Tell Josh I’ll trade him some quiche for deep dish pizza!! Ooooh yum, I love a thick crust pizza! I worked part tme at a pizza place a few years back and buffalo chicken pizza always went out the door quickly. I am putting it on our Superbowl list for sure. This looks delicious! This looks fabolous! I am yet to make pizza dough and this recipe sounds perfect!! I love BBQ pizza! Great recipe! BBQ chicken pizza is one of my favorite things that my husband makes also! But this crust looks absolutely amazing! Nothing better than a deep-dish pizza! that looks great. i am going to try a gluten free version! Maria this look FABULOUS!! Tell Josh I agree! I think this would be my favorite pizza too!! I’m going to add this to our menu in the next few weeks! That pizza crust looks KILLER!!! I need it! 🙂 The only meat dish that I have craved since becoming a pescatarian is BBQ chicken pizza. Oh well! 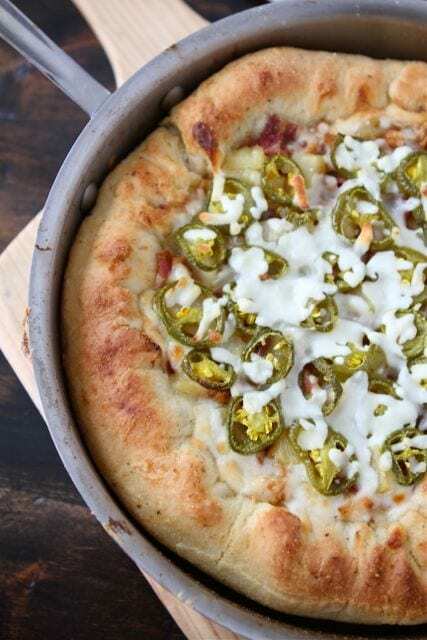 One of my sons has been talking about deep dish pizza since he got back from a mission trip in Chicago last summer – this looks like the perfect dough! Oh goodness! I love how thick that crust is! And I know my husband would love it with all those jalapenos. Mmm, that looks good. We love BBQ chicken pizza, but have never tried it deep dish! My guy would *love* this. Love the addition of pineapple. Who doesn’t love a good pizza. That crust looks amazing for just about any pizza! I’ve been a fan of BBQ chicken pizza for a long time, but I’m excited to try this crust! It looks so thick and delicious. Thanks! You’re so lucky to have a resident pizza maker! Like you, I might go for the veggie pizza instead, but I can see why this one is a hit. Salty, spicy and smoky — a winning combo. That pizza looks amazing 🙂 The very first thing I noticed was how thick and chewy the crust looks …. yum!! I love this pizza. I teach pizza making all the time and have never used milk or butter in the dough. I will definitely try this. It looks delicious! Oh wow, I love deep dish pizza and I just got my first cast iron skillet! I know exactly what I’m making. This looks amazing. I can definitely see the appeal in this…I do love me some barbecue sauce! I would love to try and make some deep-dish pizza sometime!! This looks like an awesome recipe. I am a huge fan of anything barbecue, too! BBQ Chicken Pizza is one of our favs! 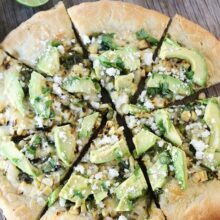 I just made a Layered Mexican Pizza last night that would be perfect for your pan! I am a huge fan of BBQ chicken pizza as well. Only I omit the chicken and bacon and add smoked Gouda cheese. It’s goes perfect with the sweetness of the pineapple. That crust looks amazing!! I haven’t had a pizza with red sauce and pepperoni in years…I love fruit and cheese and nut combinations the best. BUT if I’m going for meat…this would do it for me. One of my favorites with jalapeno? Fabulous. This looks so delicious. Love how meaty this pizza is and the flavors sound so good together. Hi! I have been reading your blog for a little while, and I am not sure if you’ve already done this, but could you tell us more about becoming a vegetarian? I am considering becoming one, and I would love to hear a little more about your process. Thanks! Feel free to email me if you have specific questions! I love deep dish pizza and really miss it having moved from Chicago to Boston! I should totally try making it at home – this looks amazing! Do you think it would work on a pizza stone instead of in the skillet? I adore pizzas but they always end up soggy in the middle when I make them. I will be giving this one a go. THANKS! Interesting….very interesting. I’ve seen pizzas with chicken before but it never seems that appealing. This looks tasty with all the jalapeños, yum! Holy flavor pop!! I looove BBQ chicken pizza and the deep dish crust is a must on my pie. Love the touch of jalapenos. I am a fan of pan pizzas, and this topping make it irresistible. I am sure it was delightful. I don’t mine the wait of dough to rise because at the end it’s a BIG reward to have homemade pizza. Thanks for sharing this BBQ Chicken pizza recipe. Ahhh this looks AMAZING!! I love the gooeyness and thickness. 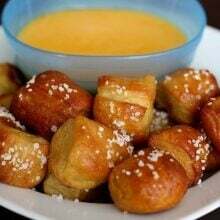 I might have to work super bowl sunday, but I will be making this soon. How do you work with the dough after it has been frozen? You need to let the dough defrost before using it. Would a large deep glass pie dish work for this? Thanks for your kind comment. 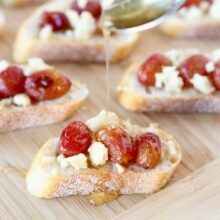 Glad you are enjoying our site and recipes! This looks absolutely delicious. I was wondering if anyone has tried using this dough recipe in the oven? If yes, how did it work out?? 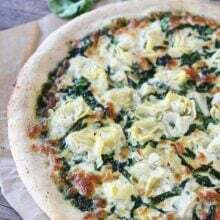 Can I make this pizza with a pre-made pizza dough? I have aluminum pans, will that work since I don’t have a cast iron skillet? It really sounds yummy! Yes, you can use pre-made dough and aluminum pans. Enjoy! What are “tamed-down” jalapeños? Hubby likes them, us girls do not! I would probably just skip the jalapeños because otherwise it sounds delicious! Made this tonight and WOW! Left off the jalapenos and used mango instead of pineapple. Hubby and I had to try to keep from eating the whole pan, and now we have entered carb coma. Thanks for the recipe. If I want to make the dough the night before should I refrigerate or freeze it? Do I let it rise before I put it in the freezer/fridge? 1 package yeast is approximately how many spoons?